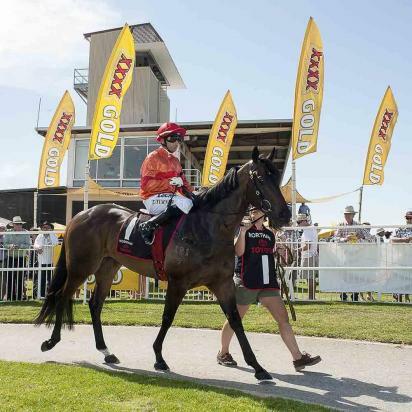 Stable war horse Marchand makes career start 45 and his first this campaign at Geraldton on Sunday. He looks to have found a suitable race over 1100m in the Pink Petticoat Handicap. The eight-year-old Oratorio gelding has drawn beautifully in gate three for Brodie Kirby who claims two kilos to bring Marchand into the race with 57kg. The six-time winner has been tuned up for his first-up assignment with a good trial behind Cognac, who ran well at Bunbury on Saturday in an $100,000 race. Rob will make the trip up the highway with Marchand, and Todd is confident of a good performance. “I think he will lead the field and hopefully he can hold on,” he said.